Most people think of archeology as a field that solely specializes in analyzing the past through the discovery of mysterious artifacts that have been submerged under layers of soil for hundreds of years. However, this is a faulty misconception. Since archaeology is about analyzing “stuff” – material culture left behind by people – it is quite possible to gather archaeological data from a site that was deserted as little as 5 minutes ago. In fact, archaeology has the potential of being extremely valuable in the settlement of current social issues. One such present-day problem is homelessness in America. This topic holds special weight with me. The town where I live has a large homeless population, and when I was younger I used to help my mom cook for them at our local soup kitchen. I’ll never forget the time a homeless man, setting up his bed next to a church on a cold night, told me, “Be thankful for your parents, and let them know how grateful you are each and every day”. I was eternally touched by his simple words. These people are very much human and very much like the rest of us, but the majority of society tends to view homeless people as very separate from the common person. Do we really know what they need? Do we really know who they are? That’s where archaeology comes in. Material culture at a homeless camp. A study was completed by Larry J. Zimmerman and student Jessica Welch that analyzed the material culture left behind by homeless people in an outdoor camp in Indianapolis. They found that the materials the homeless used can help us realize what they need, not just what we think they need. For example, they discovered a large number of canned food items, but the cans were not opened very successfully. This demonstrates how although we think we are helping homeless people when we give them canned goods, we rarely recognize that they don’t have can openers to access the food. Most food drives are for canned foods, but we fail to realize that the homeless have trouble opening these cans. Collecting can openers would be effective. Also, Zimmerman explains how he found lots of travel-sized shampoos, conditioners, and toothpastes. However, the toothpaste was the only item that was opened and used. Obviously, without running water, homeless people cannot wash or condition their hair. We are unintentionally ignorant to the actual needs of these people, but through archaeology we can reevaluate our view of the homeless and actually make a difference. Therefore, with the help of archaeology, the homeless can be humanized and understood on an entirely new level. This knowledge can aid us in developing a more accurate view of their culture, and that understanding can be applied publicly and lawfully. So, all we have to do is publicize these truths about the homeless and make the community in which they live aware of their real necessities, right? This is easier said than done. Publications are rarely made about archaeology and social matters because people don’t like hearing bad things about what they like and what they do. We don’t want to have our lives analyzed and scolded, and the truth that archaeology exposes reveals humanity’s “dirty little secrets” that we naturally want to keep concealed. Archaeological knowledge can be applied to current issues and accurately breed social justice, but this can’t occur until misconceptions about archaeology are obliterated and the field is understood by the public. 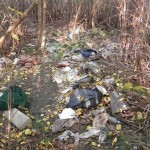 This entry was posted in Fall 2012 and tagged Homelessness by casilva. Bookmark the permalink.